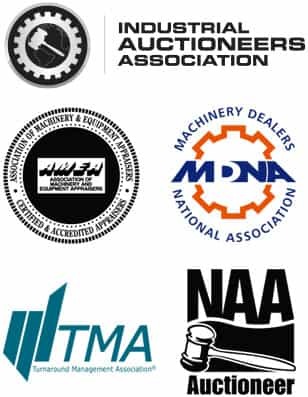 We are a 3rd generation private company now specializing in the sale and appraisal of industrial machinery and equipment. Since 1932, we have been in the marketplace conducting auctions, liquidations and providing valuations for all types of machinery, equipment, vehicles, inventories, and retail and wholesale goods. The prevailing trends and demands of our industry have enabled QCA to evolve into a reliable and reputable industrial auction company that delivers successful results. We are able to accomplish this success with an experienced staff that places the interest of our clients above all else. WE HAVE AUCTIONEERS AND APPRAISERS ON STAFF. Cynthia Merback – (Director of Operations) Cindy brings her varied background to us including marketing and advertising, sales and management. Her expertise is in project development and organization, having earned her masters degree. She manages the auction process from the signed proposal to the final removed lot and is also a Notary Public. Contact (215-327-7087) or [email protected]. Frank Dush – (Auction Set-up) Frank has joined our QCA family in the important area of auction set-up and removal. He is eager to assist you with your auction site needs. Your shop will be left broom swept to perfection by Frank. Jared Merback – (Technology Expert) – Jared provides support in all areas of auction technology, including lot preparation and cataloging in the auction software system, and general maintenance and expansion of QCA’s services to clients and buyers. His education includes writing, computer and camera expertise. Jared brings our business to a 4th generation! Check Out this Testimonial About Our Staff!